-but I am getting ahead of myself. Before we get to the end of the film and the revelation of who is a legend and for what reason, there is quite a lot of movie to get through, and for a long time, it's pretty damn good, all in all. I'd even go so far as to say that it has absolutely the best first act of any of the three films. 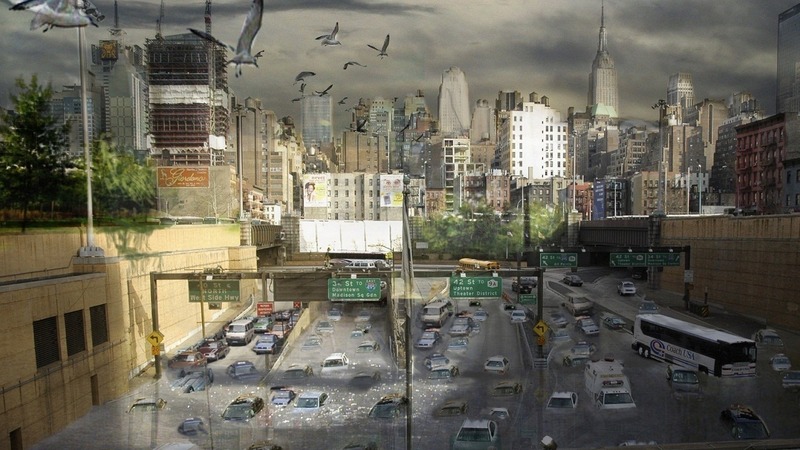 This has quite a lot to do with the technological advances that allow the filmmakers to create a post-apocalyptic New York, circa 2012, that outdoes anything in The Last Man on Earth or The Omega Man, for all the good elements of those films' settings. Here is a city overrun with weeds, herds of deer, and empty, disintegrating cars as far as the eye can see, lacking the uncanny effect of The Omega Man empty Los Angeles but replacing it with a more horrifying sense of total devastation (along the way, the film's attention to detail even encompasses a few clever Easter eggs, such as the teaser poster in Times Square of Batman vs. Superman, opening on Memorial Day 2010, or the gas station featuring regular unleaded at $6.40 per gallon). This world is the home of the last man on Earth, Robert Neville (Will Smith), and his German Shepherd Sam. Giving Neville a dog to start is one of the writers' smartest changes to the original (and yes, I just called Akiva "Batman & Robin " Goldsman and Mark "Poseidon" Protosevich clever. Forgive me), for it allows him to express himself without falling into the traps that the other two films fell into. Basically, there are three ways to approach a "last man" film: I would argue that the ideal would be to make it silent, as Matheson's novel was (one of the greatest moments in the book is when Neville calls out to a dog, and realises that he hasn't heard his own voice in three years), but barring that the two ways to add human speech are through narration, which failed so badly in the first film, or by having the protagonist speak: when Charlton Heston chatted with corpses and himself in The Omega Man, he came across as a bit batty, but it was Heston-battiness that could forgiven. By giving Neville a flesh-and-blood companion, Goldsman and Protosevich give him the opportunity to speak to himself without straining our credulity overmuch. Of course, this changes the film's take on Neville's isolation, but I'd still say it's the single best change made to the source material in the current adaptation. For the long opening act of the film, Neville and Sam wander through New York, not hunting the infected as in the previous versions, but simply trying to scrabble together enough to eat and gather DVDs to stave off the boredom. Occasionally Neville interacts with mannequins he has set up to simulate humanity; it's a sad attempt to replicate actual contact with life, and he knows it, but he pushes through anyway just to amuse himself. Ever afternoon, he goes to a pier in the hope of finding other survivors. It's hard to overemphasise how important Will Smith is to this project. Not something I saw very often. For every bit of 40 minutes, this is a one-man show, lacking much more than a few glimpses of the infected, and for Neville to retain our interest requires a charismatic actor, rather than a necessarily "good" actor. Basically, it's a movie-star role that we have to understand instantly in a few brief strokes, and Smith is one of the last movie stars we have left. Although disinclined to grapple with the tortured depths of his character, he nails this important truth: most of what we know about Neville we learn from looking at him. Smith is comfortable with being looked at, and he is just good enough an actor that Neville's inevitable descent into (deeper) madness feels believable. The movie starts to falter when it tries to be about anything other than watching Will Smith be the last man alive. For the third film in a row, Neville has been recast as a medical scientist, you see, and the early portion of the plot concerns his experiments, which are technobabble, and his attempts to capture infected humans for his tests, giving us several good views at the film's mysterious villains, and those views are not pleasing. The infected are a combination of actors in make-up and CGI, and they look like video game characters. Come to think of it, they act a lot like video game characters as well, and the film's action setpieces are all abject failures because of it: they don't feel physical, they feel like movie constructions. The point of no return is a little over halfway through the film, when Neville is trapped by the creatures in a fairly sophisticated snare that is not remotely credible as the work of mindless subhuman animals (in the original draft, Neville blundered into his own trap; if that is the subtext here, it has been buried too far for any extraction to find it). 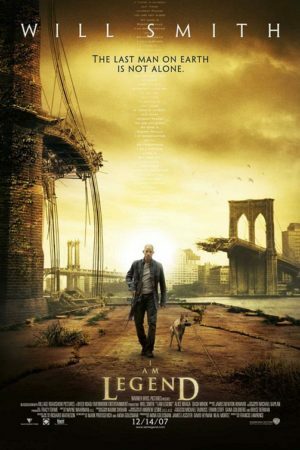 I Am Legend is a golden example of the film that reveals countless plot-holes and inconsistencies if you think about it too much after you see it, but that one is obvious even as you're watching it. Then, the expected "other last humans on Earth" show up, and the film becomes all of the worst elements of The Omega Man with none of that film's light touch. It's contrived at best, and at the worst it's a mess of the most unimaginative genre tropes you could imagine, mixed with the film's long-delayed embrace of 'splosions. When the final scene hits, an entirely unearned bit of idiotic optimism, I was a little ashamed that I'd enjoyed any part of the film at all. I think we can identify a pattern: when adaptations of I Am Legend are moody visual pieces that focus on Neville in a post-apocalyptic world, they are brilliant, and none more so than this new film; when they start to be plot-driven pieces about his attempt to save the world, they become strained and ineffective, none more so than... Well, what can you do? The opening act is too magnificent for the terrible ending to wreck it. As popcorn movies go, this one has enough of the good in it to make it watchable, and enough of the bad to make it disposable. Anyway, it's enough to distract you from the December all around.